Pay Equity – How Does Your Company Measure Up? As more cities and states than ever before are rallying to close the gender gap, racial gap, and other forms of wage discrimination, has your organization taken a step back to consider how you measure up? Law firm Fisher Phillips recently released a Pay Equity Interactive Map highlighting the equal pay laws of all 50 states. 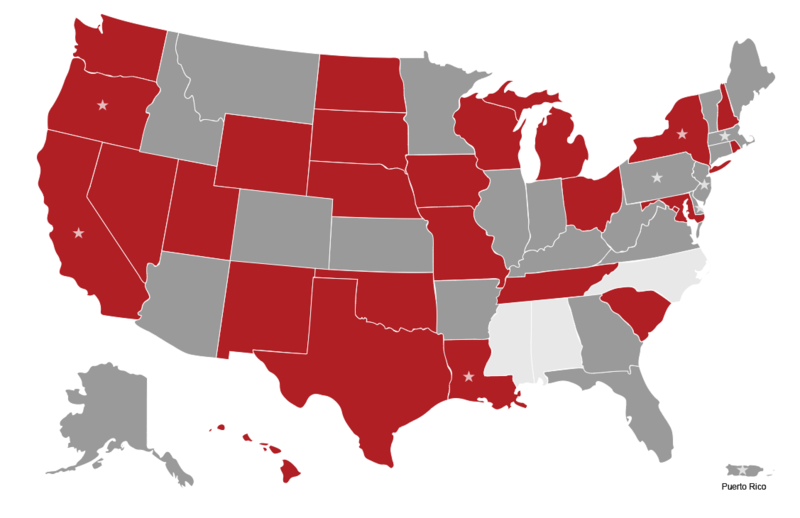 As an interactive web tool, not only does it provide an at-a-glance overview of the areas of the U.S. with the strongest pay protections, it allows visitors to explore the pay equity laws of each state simply by clicking on the map (try it here). Across the United States, 22 states (plus Puerto Rico) have passed gender-specific equity laws, 8 states (plus Puerto Rico) ban employers from asking applicants about their salary history, and 26 states have passed gender-specific equity laws as well as protections for other categories. In addition to the state-wide efforts to pass stronger pay equity legislation, companies like Starbucks have already achieved pay equity. So how can your firm begin to tackle pay inequity? By looking inwards at your own company’s pay policies and practices, and learning from those companies that have already established equal pay measures. For instance, according to a press release published in late March, Starbucks “has reached 100 percent pay equity for partners of all genders and races performing similar work across the United States, the company announced Wednesday” by basing their equity principles and best practices on equal footing, transparency, and accountability. Chiefly, they refrain from asking candidates about their salary history and base starting pay on skills, abilities, and experience. They provide a position’s pay range upon a candidate’s request in order to promote pay transparency, and also allow employees to ask about and discuss wages. They use an offer standards calculator to determine starting pay ranges for managerial-level employees, and are happy to address any unexplained differences in pay between women and men performing similar work when discrepancies are discovered. Finally, they also regularly check for compensation gaps and conduct comprehensive compensation analyses to further the goal of pay equity, looking at base pay, bonus, stock and other rewards. Sound like a lot to live up to? In the words of Lucy Helm, Chief Partner Officer at Starbucks, this milestone was the culmination of “years of work and commitment.” While you may not be ready to declare that your company has achieved pay equity today or even in the next couple of months, if you’re a proponent of pay equity, change and progress starts with you. Consider whether your organization could improve how it hires, pays, and promotes employees, and brush up on the pay equity laws in your region by using the Pay Equity Interactive Map. If your company isn’t already compliant with the rules, you’re in violation of the law, which could result in one or several costly wage and hour lawsuits. If you enjoyed reading this article, follow us on Facebook, LinkedIn, and Twitter to be notified when we publish new content.